LP-8381-Atom | Standard LinPAC-8381-Atom Linux controller with 3 I/O Slot and Linux Operating System (Multilingual Version of OS). Web Server, Telnet Server, SSH Server. Supports operating temperatures between -25°C ~ +75°C (-13°F ~ +167°F). 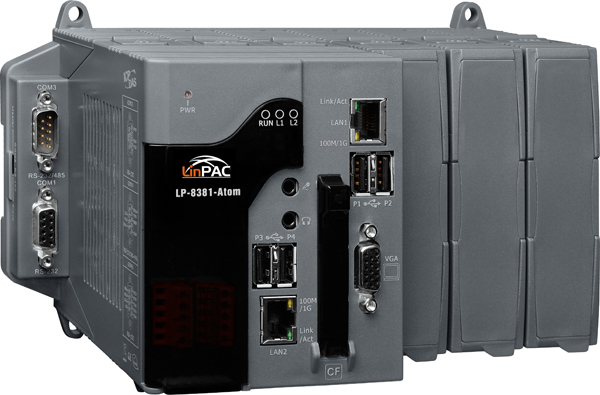 Standard LinPAC-8381-Atom Linux controller with 3 I/O Slot and Linux Operating System (Multilingual Version of OS). Web Server, Telnet Server, SSH Server. Supports operating temperatures between -25°C ~ +75°C (-13°F ~ +167°F). LP-8381-Atom module is a Linux-based PAC. Inside this device is an Intel Atom Z520 Series CPU at 1.33GHz. This model comes with VGA, USB, RS-232/485, Ethernet and 3 high performance I/O slots designed for (high profile) I-8K Series modules. Custom made user's programs are storable on external storage device, such as CF Card, USB device or RAM via ethernet. LinPAC SDK is provided for users for rapid development of LinPAC I/O applications that work along with I-7000/8000/87k series I/O modules. With GNU C Language you can develop LinPAC applications you can think of. Built-in servers functions make the LinPAC even more powerful and flexible in terms of connectivity. With LP-8381-Atom devices, you can achieve the high level of redundancy function which in turn will make the whole control system safer operations more smoothly. ICP DAS USA provides the library file － libi8k.a which includes all the functions of the I-7000/8000/87k series modules. Users can develop LinPAC-8x81 Applications easily by GNU C Language. Web Server: Through these servers, users active web pages can be placed in the LinPAC and make LinPAC be a Web Site. Telnet Server, SSH Server: Through these servers, users can remote control and transfer files with LinPAC by encrypting mode. Perl, PHP: The program written by Perl and PHP interpret language can be also executed in the LinPAC. GTK+ Library: Users can write LinPAC GUI programs by using GTK+ library. There are one resolution mode supported in the LinPAC.